If it has wheels and it explores other-worldly landscapes, it’s fair game! Today’s theme is in honor of NASA’s Spirit rover landing on Mars on January 4, 2004. I’ll be wearing my NASA t-shirt all day and may have to watch some doctor who since The Martian, which I’m still itching to see, won’t be released until the 12th. Or maybe Guy Pal and I will finally get to go see Star Wars in IMAX! However you want to celebrate humanity’s baby steps out into our solar system today, get drawing, painting, or sketching a rover! I’m tremendously pleased with both of these. They’re my favorite to date for the #dailyATC challenge. 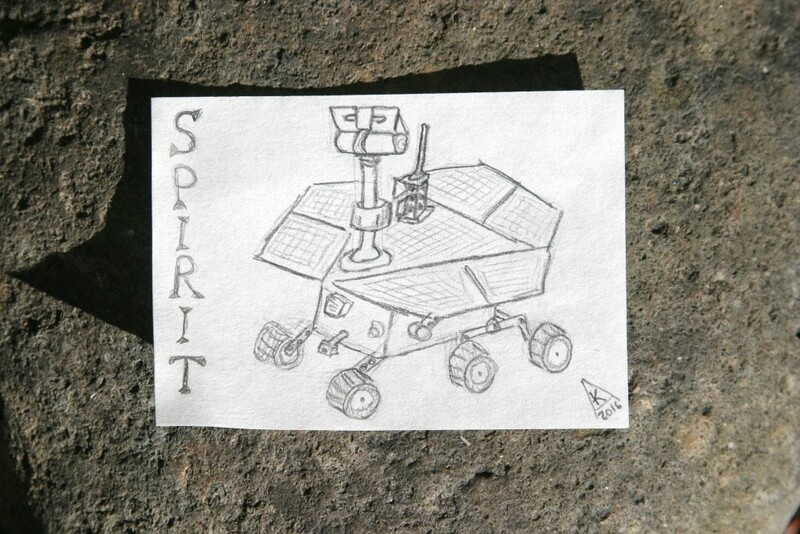 I ran out of space to get the rover’s wheels just right, but it’s still a very detailed yet fast and simple sketch of Spirit. While I’m not fond of the lettering which was inspired by the numbers on the clockface yesterday, the “T” at the end of “Spirit” did come out well and I’ll certainly draw capital T’s like that in the future. It’s a little thing, but it’s a step toward finding my style and becoming an all around better artist. As for the painting? I love that one so much. I suspect I’ll end up doing a larger painting like it at some point. I love the cool sky contrasting the warm red planet. I enjoyed the watercolor washes to create the soft feeling backdrop for the little rover. While I wasn’t able to get the cracked dry landscape I wanted in this one, the rover tire treads give a great Opportunity (Spirit’s sibling, see what I did there?) to try adding more texture, some shadows and highlights really, to the martian dirt in the foreground. The rover in this painting almost feels like an afterthought when adding it in, particularly compared to the pencil sketch of Spirit, but I love it. 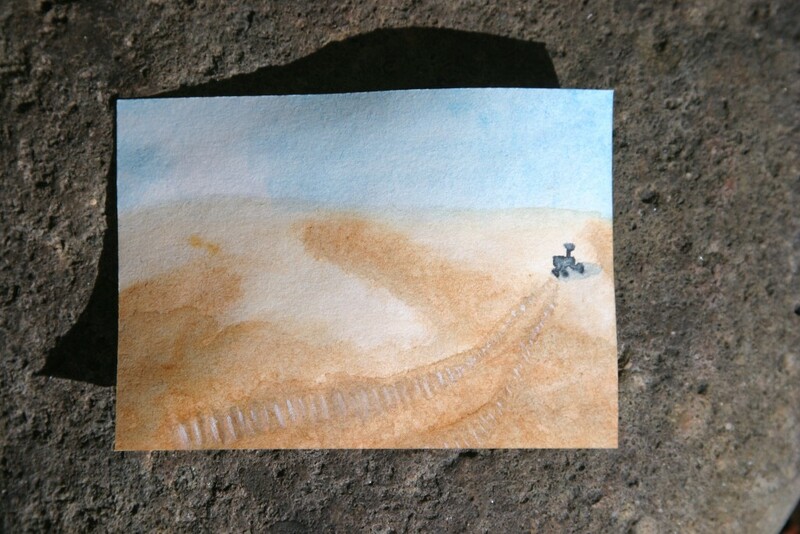 Sure, it’s not the best tiny rover painting, but the effect it has on the overall composition just tickles me. Any beginner photography class or portrait sketching or painting class would point out that for a good composition the subject should be positioned so there is more space in front of them than behind. Although we likely cannot see what the subject is looking toward, having more space on their front feels more balanced and comfortable to the person viewing the image. I deliberately placed my rover against the edge of the composition so that we cannot see where he’s headed, only where he’s been. It’s getting pretty deep for a little doodle of an ATC, but I wanted to leave the viewer with the impression that there is so, so much more waiting for us as we explore our universe which we can only imagine. I did not sign the painting as I feel that it would detract from the overall composition to add my mark. Sometimes on these little ATCs that’s just the way it is. If I were to leave it loose, I’d sign the back. Since it will be mounted in a book with my other dailyATCs, I’m not particularly worried!